I was initially in a ward with 4 beds. I spent a month there, and the other 3 beds were almost always occupied. Even though I was on the pediatric floor, the powers that be apparently thought it was OK to put young women in the ward on the pediatrics floor. And I don’t mean teens. I mean adults. Yes, young adults, but adults. At 16, I was not entirely sheltered, but I grew up in a white suburb of Detroit where we played outside a lot and I rode my bike to see my friends. By myself. Fairly normal stuff, with nothing particularly eventful happening. The women who wound up being my roommates universally came from what I perceived to be very bad situations. Almost all of them were raped or abused. In some cases, brutally. None of them ever received any counseling or other services because in most cases the abuse was at the hands of a known person like a family friend or even a family member. More than 1 or 2 of them were hospitalized for pelvic inflammatory disease. They typically shared their stories, usually at night in the dark, and it sort of became a running narrative. One gal would go home, and another one would come in, and the story sharing would start over again. I was shocked. I was saddened and I was helpless to do anything for them. In some cases their mothers or other family members who KNEW of the abuse and did nothing came to the hospital to visit. And I sat in my bed and wondered how these things could go on, and how these women could get out of bed in the morning. It was a strength I will never be able to comprehend. There are a great many things I am sorry to say I can’t remember (like the name of the English teacher who visited me in hospital), but I remember these women and their stories. I think they found solace in each other, at least I hope they did. There were two notable exceptions: one was a young mother and another was a teen who was also a patient of my gastroenterologist. The young mother was in and out quick. The other teen was there for a bit, and nobody could figure out what was wrong with her. She lay in her bed moaning all night. She was not treated with much respect by the hospital staff, I think because she was a frequent visitor and had a reputation as a malingerer. At some point my doctor (and hers) fitted her with a TENS unit and the change was instantaneous. She was able to get out of bed, and to talk. And to torture me. Most of my time in the hospital was NPO, meaning I couldn’t eat. I was receiving lipids every day through a central line in my chest. This teen with the TENS unit ordered herself a pizza one night for dinner. And then stuck it under my nose. Now, I’ve been on the receiving end of bullying. Oh yessiree Bob, I have. But this was beyond making fun of my hair or my clothes or my glasses. This was cruelty, plain and simple. Who does that kind of thing? I was stunned, and I don’t think I said anything. I may have mentioned it to my favorite nurse, but honestly there wasn’t much they could do about it. What drives someone to be cruel? I don’t know, but in this case I can certainly guess. She seemed to have a need for attention, and yet she wasn’t getting any. But me — I got plenty of attention. There was always someone there to see me: teachers, classmates, friends, parents, siblings. I received flowers, balloons, gifts, you name it. And look, I was not a popular kid by any means, but the friends I did have really cared about me. I can’t remember anyone ever visiting this girl, even her parents. And that’s not right. She was gone in a few days, of course. And I stayed. And there were other roommates from other hospital stays. A girl I knew from school. A woman who was always asking me (me? I’m not supposed to leave my bed!) for help. But none as memorable (or as annoying) as those from my first stay. I’ve come to understand there are significant socioeconomic reasons for why people wind up very sick, going to the ER, and becoming hospitalized. These aren’t people with a loving home and health insurance, who are in a position to receive preventive care. They are just barely hanging on, and that’s not right. Healthcare is a basic human need, and once you’ve been in the “system” and seen how many people are denied care — and it’s usually those who need it the most — you can’t un-see it. Everyone deserves care, before they’re so sick they need the ER. I too was put in a hospital at the age of 16 yrs old in a hospital for adults ! I remember a lot of friends I’ve made over the years …… Some were angels I swear ! There stories inspired ! I use to call them my single serving hospital friends ! 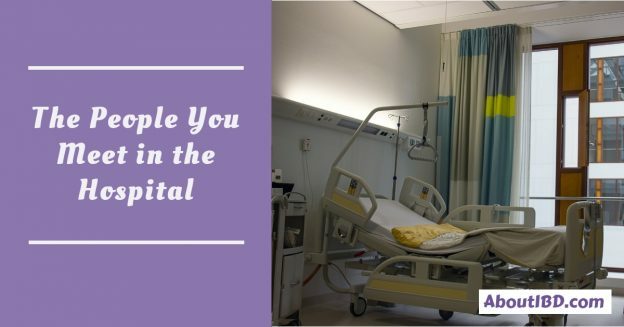 Like everything else in the hospital …….friendships always seem to come at the right time …….lessons learned …….a kind story . Once a woman left me a poem I still have to this day ! I spent a lot of time wondering around the hospital when I was young ! Always seem to find someone close to my age that was flaring at the same time ! We go to the roof and listen to music and suntan with our Ives ! Picnic on the grass near the river ….playing jokes on the nurses lol and even the nurses playing basketball with us that they would set up in the hallway for us ! At one time I went in in November and came out in May ! On Easter all the nurses and the staff decorated my room for for my daughter then two years old ! They brought presents for us because it was also our birthday ! I’ll never have an experance like this again ….in this day and age ……..they just don’t have the time ! This was 92 ! Do you still live in Michigan ? Ok, I would have smacked that girl’s face RIGHT in to her pizza! When I’m NPO, my husband doesn’t even bring his own food into my room. He always eats before or after he visits. Do you remember me having you moved? I managed to get you to tell me why you were upset and I insisted to the doctor that you be moved due to stress. Yes, I do remember that. The situation in a ward with non-pediatric patients was untenable.